I Spy with My Little Eye analyses and discusses our changing behaviours as a society. Why was this an important book for you to write? This book was important for me to write for three different reasons. First, on a personal level, researching and writing this book has helped me think through a number of concerns that have been in the back of my mind for a while about the direction in which our society is heading. As a result of this process, I’m more convinced than ever that I, as a parent, need to make active choices that go against some of today’s societal trends if I’m to provide my children with a sensible worldview and a solid starting point in life. Second, I find it worrying that there isn’t greater debate about the values and norms underpinning our society. I think we need to acknowledge and perhaps rethink many of our behaviours if we wish to solve some of the symptoms of ill-health that are plaguing our societies, such as stress and anxiety, financial indebtedness and shallow aspirations. It’s difficult to change course if we don’t know where we’re heading. Acknowledging the problems is therefore a good start. I raise a lot of issues for discussion in this book and it’s my hope that it will be used for spurring debates in schools, book clubs and other places. Finally, as I see it, questions around morality have too often been outsourced to, and monopolized by, organized religion. What I want to show by using the seven deadly sins and seven heavenly virtues is that being religious is not a precondition for being concerned about, and engaging in discussions around, morality. This book uses a combination of statistics, quotes and recent topics to illustrate various points. I thought the research was outstanding. What was one thing that surprised you while you were researching this book? On the whole, the data I used in the various chapters supported the hunches I already had about the issues I raise. In that sense I wasn’t particularly surprised by what the data showed. That said, I was still horrified to have my suspicions confirmed, especially when it came to statistics concerning children, such as the large amount of time they, on average, spend in front of screens, and the little time they spend outdoors. This book looks at some of the problems affecting Britain s society today. Is there a problem that is unique to Britain? What is a problem that is shares with the world? Although I’m drawing on material mainly from the British context, the issues I’m discussing are applicable to many more countries than the UK. I would argue that much of what I write about are trends found across the Western world. For example, in the first chapter titled Pride I discuss how today’s ‘celebritisation’ – the increased celebration of celebrities – affects the aspirations of young people towards careers that come with fame and glamour. This trend is far from unique to Britain. Seeing, for example, that the reality TV series Keeping Up with the Kardashians is apparently aired in 167 countries, I would say this issue is rather widespread. Also, the role of the West as a predominant exporter of popular culture and information means that the norms and values we experience today in Britain may well be the norms and values experienced across the developing world in the years to come, if they aren’t already. I think it would be a worth-while exercise to organize cross-cultural debates around the issues I raise in this book. For example, it would be interesting to set up panel debates at universities for students from different countries to discuss commonalities and differences in how they perceive values and norms playing out in their respective societies. I understand that you currently live in London, but you’ve also lived in various other countries. How has this affected you as a citizen? I was born and raised in the Northern Swedish countryside and I have moved many times as an adult, both within countries and across countries and continents. For over a decade now I’ve called England my home; starting off in London, moving out to the Essex commuter belt, and more recently setting up shop in rural Devon. These moves have naturally altered the mirrors in which I see myself in relation to other people and cultures. Each time these contextual mirrors have changed I have had to step out of autopilot mode and take stock. In that sense, I think the many moves have made me wiser and more understanding as a person. They have also added a comparative perspective to my societal observations. For example, I think I have a better grasp of American politics because I’ve lived in both Montana and Washington D.C. And, I think I understand European geopolitics better because I’ve called Sweden, France, Spain and the UK my home. On the other hand, I would probably have exercised a louder societal and political voice if I had stayed in my home country. Being an immigrant comes with a natural wish to blend in, and to be accepted. Especially after Brexit, I have sadly found myself adding things like ‘my husband is British’ or ‘I’ve been in England for many years’ when I meet new people simply to justify my existence in this country. I must also admit that I’ve had a fear when writing this book that people will think ‘who are you to come here and judge us?’ I sincerely hope the book won’t evoke such feelings. In my next book I highlight the Western world’s evaporated trust in politics, business, and international institutions and argue that we need to tackle this lack of trust through greater focus on integrity and honesty in public life. I shed light on a number of the mechanisms believed to induce integrity through interesting (and hopefully amusing) cases from around the world, including whether Donald Trump’s fibbing can be stopped by naming and shaming, and if FIFA’s culture of corruption is finally an issue of the past. My intention with the book is to re-package academic research into an approachable format and let interesting cases bring the theories to life. The book is only in its research phase so it won’t be ready for publishing for quite a while still. Which direction is our society heading in? Does it provide a good enough nurturing ground for the next generation to flourish? Is it time we took a good look at our values and behaviour and changed course? Dr Linnea Mills offers a frank discussion about the prevailing norms and values in today’s Britain, interpreted through the seven deadly sins and seven heavenly virtues. She tackles head-on topics as diverse as celebrity culture, work-life balance, immigration politics and economic divisions. This is a book for anyone with a keen interest in society, philosophy and politics. Get inspired and join the debate. 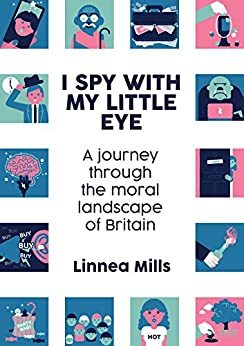 I Spy With My Little Eye: A journey through the moral landscape of Britain, written by Linnea Mills, is a novel written in an attempt to understand the morals, norms and values held by Britain’s current society. It is based around the seven deadly sins and seven heavenly virtues and uses these ideas as metaphors for the current issues present in society. There is a combination of statistics, quotes and recent topics to illustrate the consequences of economic divides, celebrity status, money, power and greed. It will leave you wondering- what is your interpretation of wealth, happiness and success? 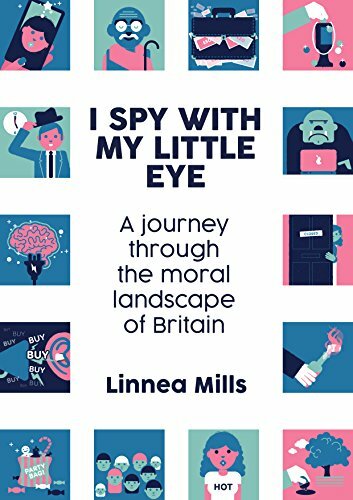 I Spy With My Little Eye is a masterpiece that analyses and discusses our changing behaviours as a society. Prepare to reconsider your personal views and be confronted with statistics and studies that prove just how much of our lives are shaped by media, “celebrities” and power. It challenges the norms held by today’s social standards and instead encourages the reader to consider whether the behaviour we partake in is a reflection of our true intentions and beliefs or are we just following the crowd mentality. It also pushes you to contemplate whether your behaviours actually contribute to any form of personal or societal gain. At times I felt as though I could see the world in a new light, especially reading alarming studies about what children aspire to be or the implications of the celebrity phenomenon on our culture and identity. Even though the chapter titles are based around Christian values, the author stresses that this is not a religious book and instead uses these sins and virtues to simply reference problems in Britain’s society- with a cheeky nod to our internal moral compasses. At what point does wealth become an addiction as opposed to a simple goal? And is it moulded by society or what truly makes you happy? One of my favourite chapters was one that discussed Envy. With social media being such an integral part of most people’s lives, it was interesting to see the comparative statistics of happiness between those who continued to use the social media platforms or compared to those who gave them up. It also discusses trolls, consequences of online abuse and the implementations of social media on politics. I was impressed at the depth of knowledge presented in the book as well as the sourced quotes and studies. The staggering statistics are mind-boggling and emphasise the manipulation of greed in positions of power. Linnea Mills also uses current events and trends to strengthen her arguments further and increase the validity of her ideas. I would recommend this book to anyone and everyone! It a perfect balance of social issues, philosophy and facts, combined to create a piece of literature that challenges your belief on what makes you innately happy.